That's right: I'm writing to you today, dear Readers. I assure you, it's still me. A new season began this morning, and I'm not talking about the new school year (although that started today as well). I'm releasing my new website out into the public, ready for you all to join me there instead of in this space. If you're looking for posts from me, check there. I assure you I'll keep writing. 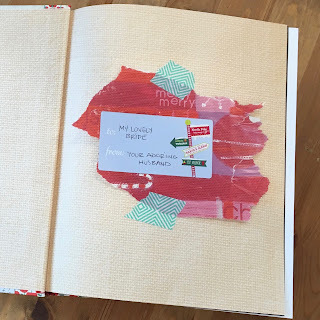 If you want to follow me on Instagram, I'm there as @love_scratch_blog. It's been a fun journey writing in this space, and I'm so thankful to those of you who have stuck with me here. I hope you'll visit my new home (which is still young and a work in progress) and continue to read the things that appear there. Thank you for all your encouragement and love! 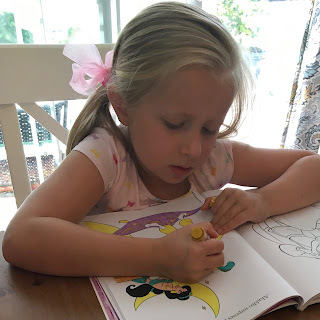 I watched Addie closely at the breakfast table this morning, soaking in the way she sat in her chair, feet dangling and humming to herself as she colored. She has done that every morning this summer, for hours and hours at a time. When she finally took a short break to munch on fried eggs and sliced strawberries, she chattered excitedly about how there were only four more days left until Kindergarten starts, and wave of lonesomeness washed over me. Feeling sentimental, I said, "Addie, I'm really going to miss you." Mia piped in, asking "Like when you're dead?" We all laughed, and it felt good to giggle with those Goobies knowing next week I will be faced with the task of getting them back into the swing of a new routine. 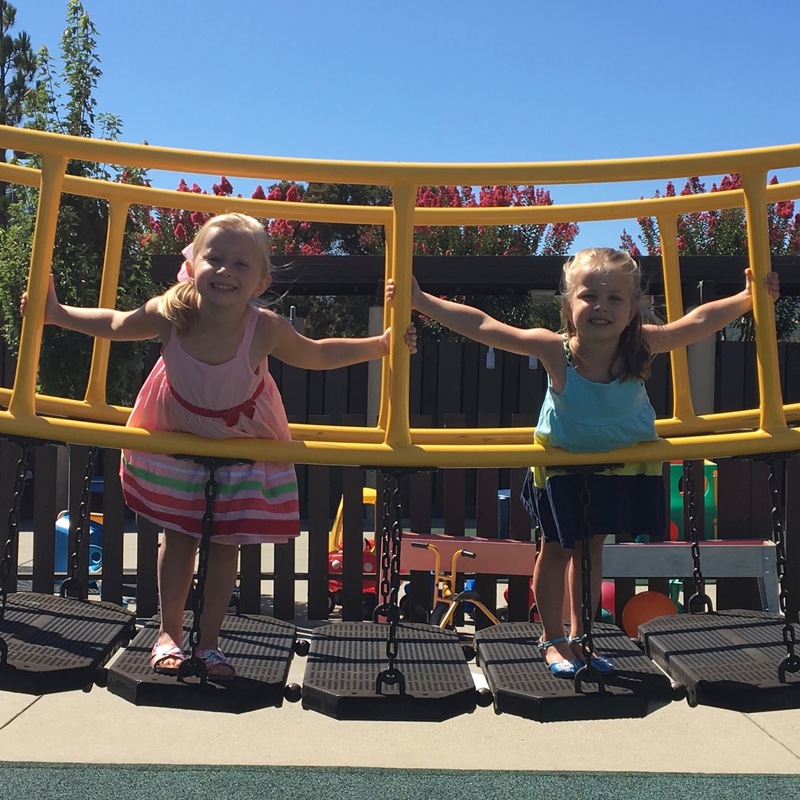 Both girls start school on Monday: Kindergarten for Addie and Pre-K for Mia. 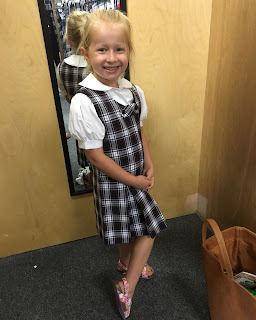 I spent last week scurrying around town outfitting them with everything they would need for the year ahead: school uniforms; socks and shoes; a matching backpack and lunchbox. 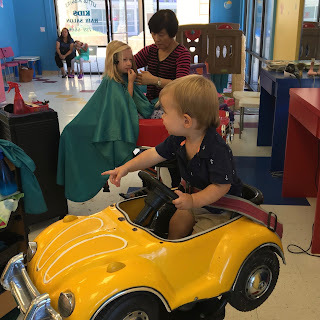 This week there are haircuts and grocery shopping and doctor's visits and new Epi Pens and all those forms. 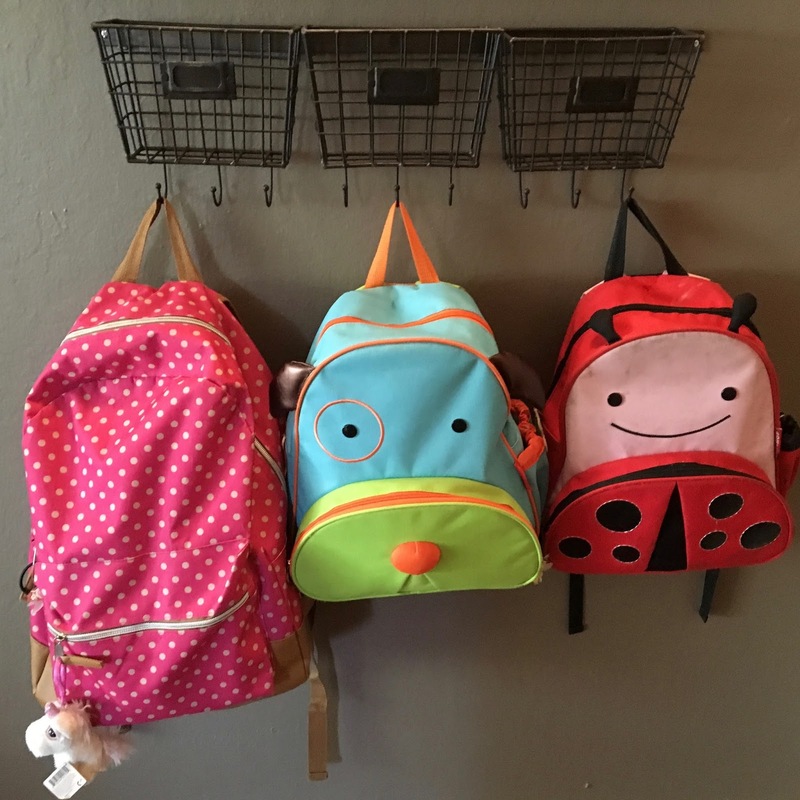 We're lucky we don't have to worry about shopping for school supplies for either of them this year (thank you, Pre-K and K school supply fee). I am already dreading next year when I will join the all other Target moms who approach the school supply aisle as a beast that must be tamed, eyes fierce and determined. By the time I am done, I imagine I will look just as bewildered as they do as they wait in the checkout line, wanting desperately to throw my hands up and holler "I give!" I have mixed feelings, of course. 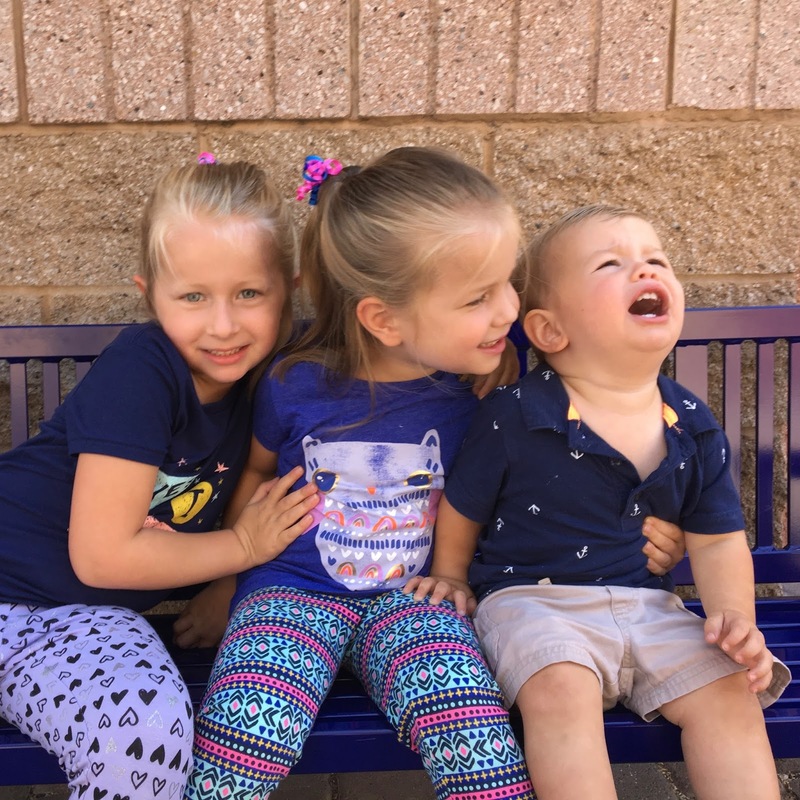 Preschool and Transitional Kindergarten trained us for well for the reality of "real" school days and I am ready for a break from wrangling all three kids at the same time. Pre-K isn't as hard to swallow. I'll have Mia with me for most of the day still. But Kindergarten: it's like the first tile in a long stretch of dominoes winding its way through her school life. When we wave goodbye on the first day next week, we tip that tile and the rest will fall all too fast. I believe we have done well to prepare her for her first day. And I also know there are plenty of other big moments to look forward to after this one passes. But for now, in these last few days, I am weepy. It is deeper than just waving goodbye to her for a few hours; we are waving goodbye to her babyhood. She has graduated into big kid land, and that is not easy for me. I am afraid I have not done enough to prepare her. Maybe that is why I spent so much time running around like a crazy person looking for the perfect back to school things--to make me feel a little better about the whole thing. 1. Surprize by Stride Rite. These are our go-to school shoe for all the small, still-developing feet we have around here. 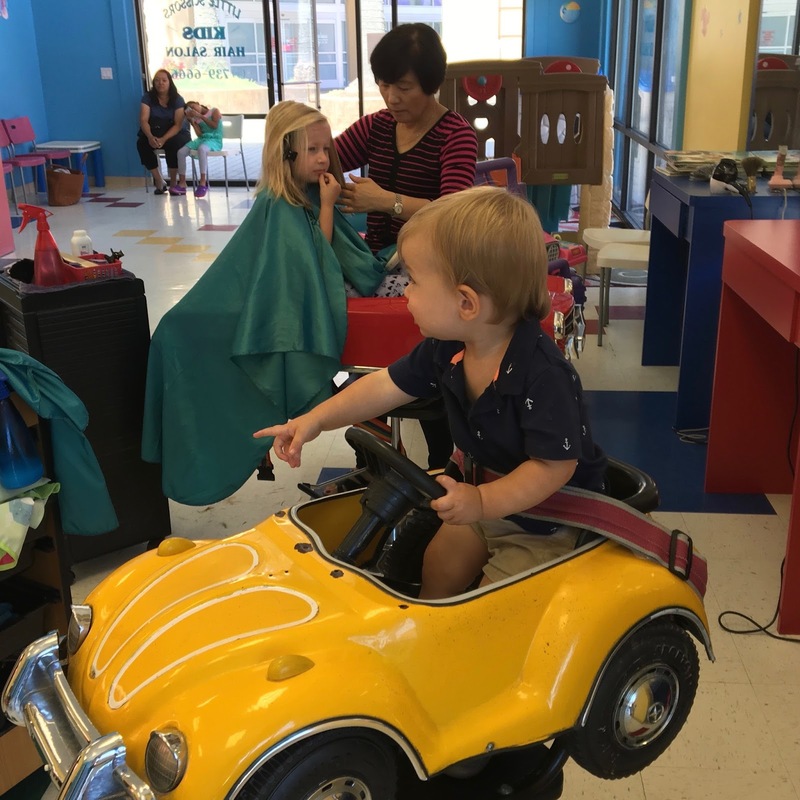 I like regular Stride Rite, of course, but the last time we visited our local store there the proprietor wasn't exactly kind, nor did he honor the advertised incentives that brought us into the shop that particular day. Plus, at Target, I don't have to pay $60 for a pair of shoes these cute little toes won't fit into in a few months. 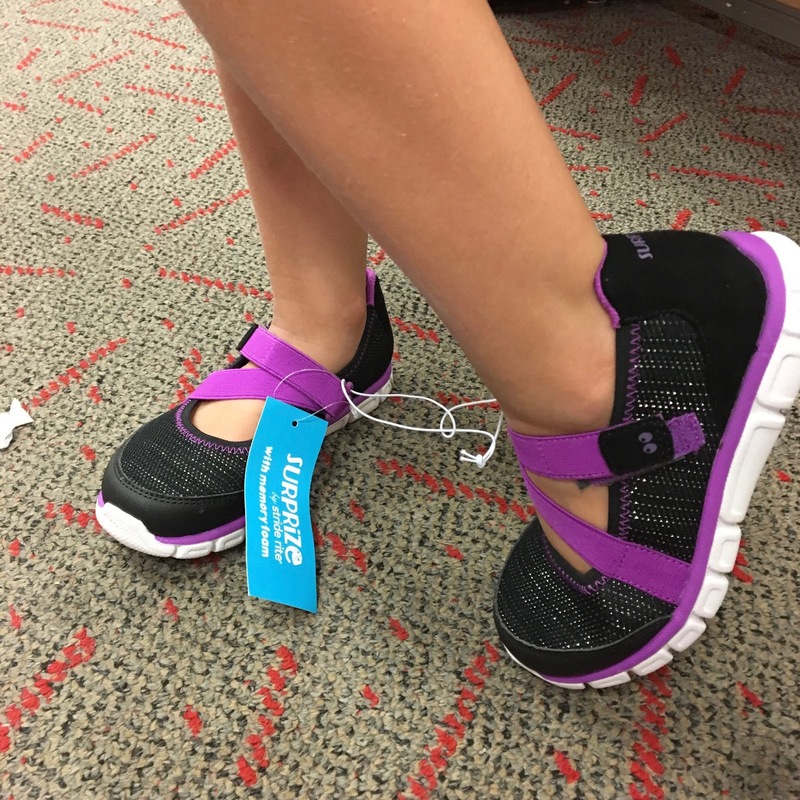 I can pay less than half that and still get high quality shoes that our kids really like. 2. Potterybarn Kids Mackenzie Backpack (Small). 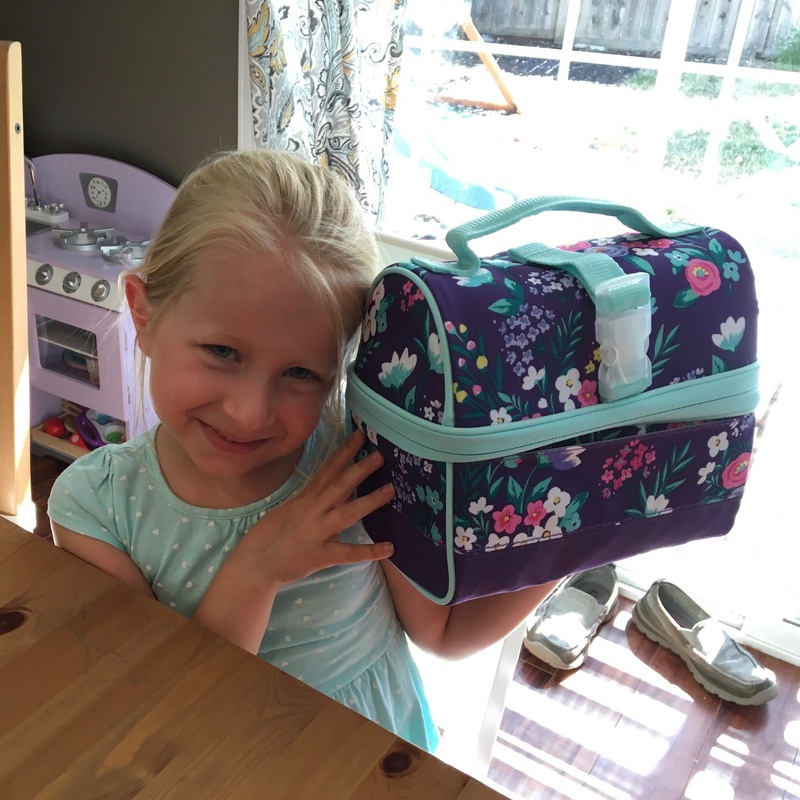 Addie adores this pretty little backpack, and I like it because it has cushioned straps and is a perfect fit for the small shoulders that will carry it every day. 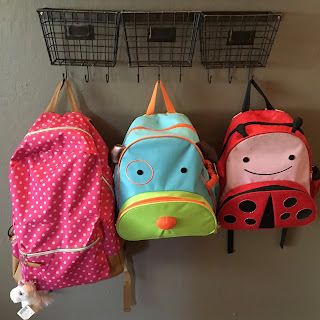 It has not come in the mail yet, so Addie has been practicing hanging her old backpack (that has always been much too big for her) on our new backpack hooks. It is in perfectly good condition, and I gave myself a bit of grief about it because she doesn't really need a new fancy backpack. I forgave us this indulgence though because the girl fell in love with it, and if a beautiful backpack reinforces her excitement for school? So be it. 3. Also, this matching Retro Lunchbox--for so many reasons. First, it's so cute I wish I had one of my own. Beyond that, it is tall and accommodates a warm food thermos with ease. Also, the buckle is genius--hook the thing right onto the backpack and wave goodbye with confidence, knowing the little lady won't forget her lunch as she leaves the car in a hurry, as I imagine she will. 4. 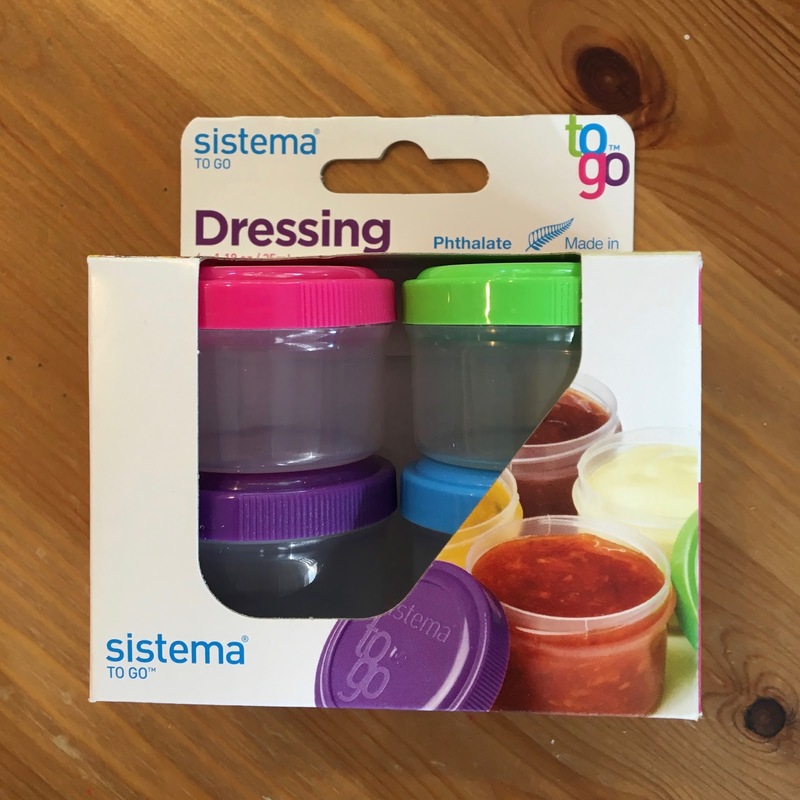 Sistema Food Containers. These are so easy to open, which is a big deal in the confidence department for Addie. The last thing I want to do is set her up for failure. Knowing she can open and close these things without help eases my own nervousness about lunchtime success, so I can only imagine how they must make her feel. Bonus that we found their dressing containers--she was perhaps even more excited than I was to find them, saying she could have ketchup with her carrots without spilling the sauce. We spent a lot of time this summer practicing opening and closing them, as well as ripping labels off of granola bars and poking straws into juice boxes. She is confident she can do lunch on her own now, which is both super awesome (she doesn't need me anymore!) and heartbreaking (she doesn't need me anymore!). So you see? We're set. I think. My mom took Addie out for a shopping and lunch date today. They never actually made it to lunch, though. Addie said she didn't really want to go to a restaurant: she was anxious to get home because she missed her Mommy. It made me feel a little less silly about being so weepy lately. I guess we will both have to get used to this new dynamic--being away from each other so much. The cupboards are pretty empty again. I swear I went shopping five days ago, but between summertime growth spurts and the bottomless pit of a boy we share our table with now, food doesn't last long around here. Gone are the days when we could get by with making dinner out of a single pound of ground turkey, or when we could stretch a pint of strawberries through more than one meal. These kids clamor for snacks before I finish clearing up the mess from the last time they insisted I feed them. They eat all day long, and I spend so much time feeding them, I usually forget to feed myself. I never thought that was possible. To make matters more desperate, we're on week three of swim lessons, which means the girls are even hungrier than usual. They come out of the water ravenous for a snack right now. I feel like I should be stuffing a muffin in their mouth while I wrap them up in their towels like burritos, instead of giving them fruit leather to munch on after they were settled in the stroller. This week, I followed that feeling and made some mini muffins. I balked at the 90 degree weather, turned on the oven anyway and proceeded to figure out a way to make applesauce and buckwheat appealing to little tummies. Cranking the air conditioning up a degree or two seemed a small price to pay to have a heartier snack at the ready after swim lessons were over. But wouldn't you know, those Goobies accosted me for the muffins on the way out the door on Monday afternoon, insisting But I'm hungry right now! and Yes, I'm sure it won't give me a tummy ache while I'm in the water! Do you know the muffin lady, the muffin lady, the muffin lady? Do you know the muffin lady who lives in San Ramon? Yes I know the muffin lady, the muffin lady, the muffin lady. Yes I know the muffin lady because she is my mom. She then giggled and settled into her seat, clearly enjoying how clever she was, and finished the third muffin before we got out of the driveway. The next morning, I set what was left of the first batch of those muffins onto the kitchen table and let the girls help themselves for breakfast. Before I knew it, most of them were gone and Mia looked intent on finishing every last one of them. "You really like those applesauce muffins, huh Mia?" I asked, trying to confiscate the last few to save for their original intended purpose. "Yep, I sure do," she said. "I guess I'm just a muffin girl." The entire batch was gone before lunch. This afternoon was cooler, so I took advantage of it and had Mia help me bake another batch of those little muffins. I am the muffin lady, after all. I have a reputation to live up to--and hungry mouths to feed. These muffins are a great way to introduce buckwheat flour to your battery of baking supplies. 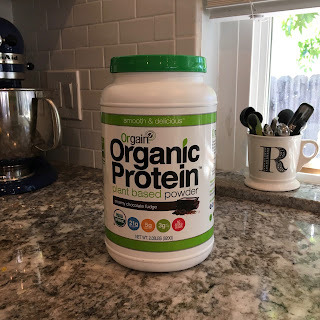 I experimented with buckwheat when I first went gluten free, but it has taken some time for me to find a combination of flavors that made me really fall in love with the stuff. 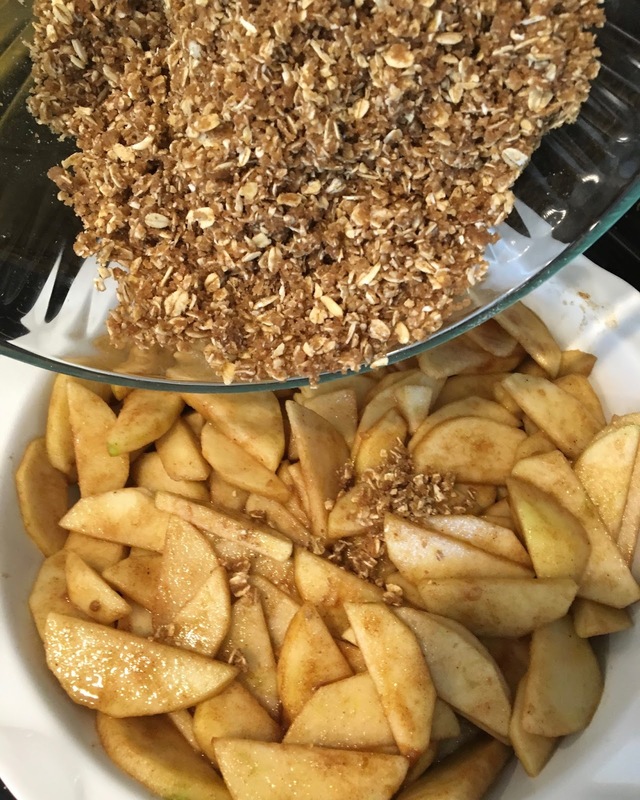 The applesauce, cinnamon and coconut sugar work together perfectly here, making the buckwheat's subtle nutty flavor shine. All of my kids eat these muffins with enthusiasm, and I imagine yours will too. First, turn your oven on to 375 degrees and give a mini muffin pan a good coat of nonstick cooking spray. Move on to the dry ingredients. Measure the first seven ingredients into a medium sized mixing bowl and whisk them together. Set aside. In another, slightly larger mixing bowl, add all the wet ingredients (the following five ingredients) and whisk to combine well. 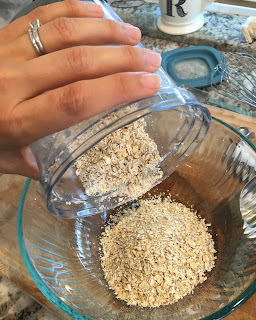 Then gradually tip the dry ingredients into the wet ingredients, whisking as you go until the batter forms and there aren't any more pockets of flour to be found. Scoop the muffins into the muffin pan using a mini ice cream scoop (or use regular spoons to fill each muffin cup with about 1 1/2 Tablespoons of batter). Dust with cinnamon sugar and bake for 13 minutes (or until a toothpick inserted into the center comes out clean). Date nights for us are a little different now than they were before we were married. Gone are the days when we can act on impulse and just go, destination to be determined. Remember that night we found ourselves at that retro diner in Palo Alto at 11:00 at night? It felt just a little bit naughty, being out that late on a work night, but what did we care? Sleeping didn't seem so important as we cradled those thick ceramic mugs of coffee and talked about how out of place we felt surrounded by all those Stanford undergrads. These days, date nights are far more predictable. Once the kids are in bed, I take care of dinner--easy, because it's late. 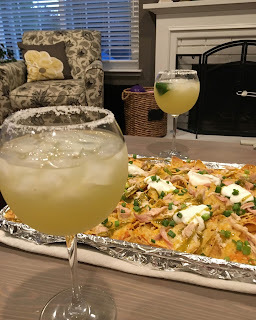 Last night: Chicken Nachos, as per usual. 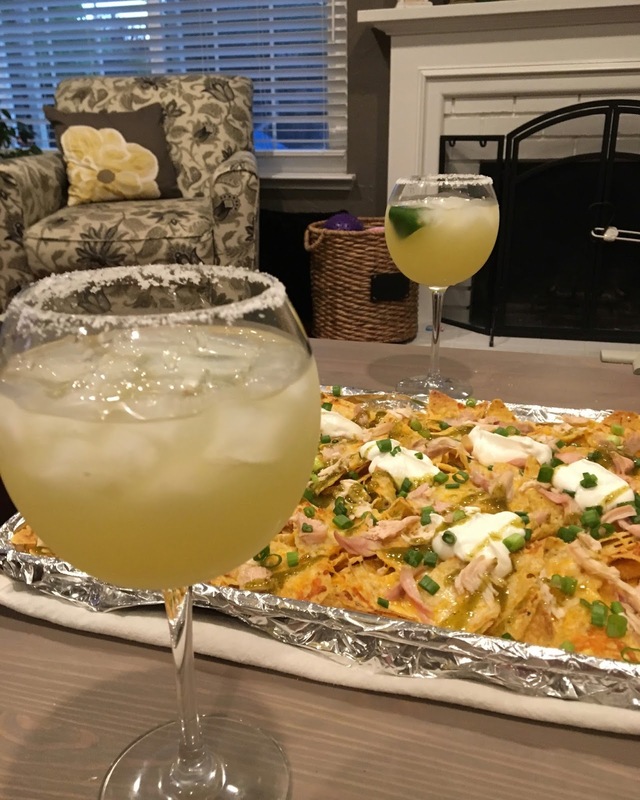 You're in charge of drinks, sometimes tossing me a can of sparkling water and other times serving icy cold margaritas in tall glasses rimmed with salted. We scroll through Netflix together, trying to break out of the norm and choose something new, but more often than not we end up back on The Office, like last night. We're flirting with boring, I suppose. But how much fun was it watching Jim and Pam finally find their way to each other, me unsuccessful at stifling my ugly cry, and you laughing at the sight, like you always do? I giggled with you, of course, feeling silly for being so sentimental, but I couldn't help it. I relate to Pam, how it took her so very long to recognize the depth of her feelings for Jim. Watching her grow and change and take risks until finally the two of them collide? It moves me. Admit it: you got a little nostalgic too. When Pam's face lights up after Jim says, "Then it's a date" you flashed me a silly grin and talked about the way it felt to hear me finally say yes to you after all that time. You put your feelings for me behind you too, just like Jim, and when my heart toward you turned tender, you realized your own heart never changed a bit. You loved me before I loved you. Can you blame me for the ugly cry? So what if we don't go out on midnight drives to find quirky little spots to sit together and talk about stuff? I know it's not nearly as adventurous, but I think dates at home with you are just as awesome in their own way. I can only loosely call this a recipe because there are no real measurements and the ingredients list is flexible. It's the method that matters here. Sheet pan, broiler, tortilla chips and an endless variety of ways to paint the canvas, so to speak. This is our own favorite, but we have a soft spot for spiced ground beef with tomatoes and Franks' Red Hot, too. They don't have to be spicy, but we pour on the heat because that's the way Joey likes it. First, click your broiler on to high. This will help the oven heat up and melt the cheese quicker than if the pan goes under a just-turned-on-broiler. Next, cover a sheet pan with aluminum foil. (This is to ensure a quick clean up. If you like scrubbing charred cheese off of your sheet pans, then skip this step.) 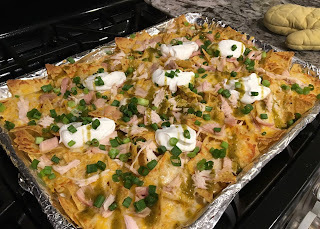 Cover it with a good coating of non-stick spray so the nachos don't fuse with the foil. Spread tortilla chips over the pan, scooting them together to obscure all the foil. Then, cover with as much cheese as you like. We tend to like about 2 cups. Next, sprinkle on the chicken. Pop the pan into the broiler and close the oven door--but don't go away. Keep a close eye on it because it goes fast. Once the cheese is melted and bubbly, pull the pan out. Scatter the onions on top of the melted cheese, squeeze the lime, and dollop the sour cream. The finishing touch is the hot sauce. Remember all those years ago when we started praying for fruit? I think about how that prayer has been answered every time I pick an apple off of our apple tree. It all started because we cancelled our membership to a local Consumer Supported Agriculture (CSA) because our grocery budget couldn't really handle the novelty of it anymore. It seemed like a good decision at the time. It was the middle of winter, we were getting a whole lot of lacinato kale, swiss chard and leeks that just sort of sat in our fridge, sad and limp at their lack of use. There were only so many ways we could think to cook a leek, after all. Even so, my ego took a hit when we decided to forego the delivery service for awhile. I was an informed and responsible consumer and belonging to a CSA made a difference, you know? But we were still getting used to the expenses that arrive the same day a child does, and so we chose to go back to buying commercially produced fruit and vegetables again, promising we would be more diligent with our dollars for awhile and go back to the CSA when our wallet loosened up a bit. But time kept us moving along and we didn't go back. 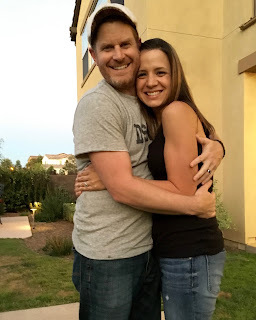 We had another baby, moved in with my parents and started the year long work of saving for a house of our own. 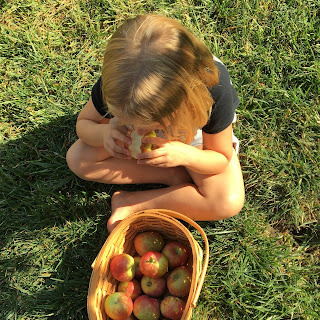 In the midst of all that, we started remembering our CSA boxes with the sort of wistfulness that made us long for the ease of just-picked fruit magically landing on our doorstep before the sun came up. We even missed that fridge full of wilted winter vegetables (leeks in particular, ironically, because of those tempura leeks. Hallelujah.) We talked about joining the CSA again, but we just couldn't seem to make it work for our family. I still felt pretty deflated about it. Even the promise of making it work once we moved into our home, the place we'd plant ourselves and grow together as a family, didn't really help. And so I did what I always do when I don't get my way: I pouted. When I came to my senses, put away my bottom lip and thought about why any of this mattered to me at all, I realized this: something primordial is lost when produce is produced commercially. Food was created to be good. It is supposed to taste good. The way our food system works now, most of us are missing out on the goodness of that food. Everyone knows a tomato freshly plucked from its vine tastes nothing like its mealy, flavorless counterpart available at any major supermarket. Our kids sure do: they spit out grape tomatoes purchased from the store, complaining the little things sting their tongue. But they've race toward our own grape tomato bush nearly every morning this summer, picking the firey red ones as fast as they can shove them into their mouths. God saw that it was good." I have a hard time believing God only saw the functionality and efficiency of his design as good. This is the same God that illuminates the sky at night with beacons of blazing glory; the same God that infuses a baby's head with its intoxicating sweetness; the same God that paints flowers in resplendent hue. This is the God that created our food for our nourishment and our enjoyment. It's hard to feel like I don't have a choice but to feed our kids virtually tasteless, pesticide laden foods. It's hard to teach them to love fruits and vegetables when the ones they're given are mushy and tasteless. It's hard to make a case for eating more of them when it feels more like punishment than something to savor. It's hard to miss out on experiencing the glory of the way food is supposed to taste. And so, I began to pray for organic fruit. And I asked you to start praying for organic fruit too. I felt a little foolish suggesting it, but since food is so central to life, I decided a strange prayer like that wasn't really so weird after all. Plus, I was ready to be rid of the weird mix of guilt, humiliation and longing that still harassed me every time I went shopping. But you didn't laugh at me. You affirmed me and added to the depth of the prayer, reminding me that fruit is the thing toward which much energy and attention moves; an end product; a result of effort spent. Wasn't that what we were doing that year, saving for a home? (Not to mention our children's lives--who they are and who they are becoming--don't we pray for a rich harvest there, too?) And so, we began praying for fruit. The organic kind. Eventually, the arduous year of saving for a house produced fruit of its own, and we found ourselves putting down roots in a house with a gnarled old apple tree standing proud in the backyard. I didn't love the tree at first, but then springtime came and we marveled at they way its blossoms sprang to life and my heart changed. 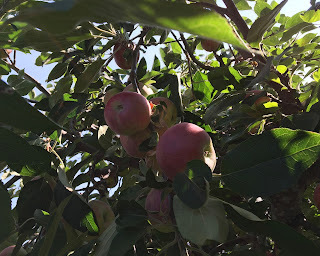 Apples followed, and come back every summer, a very real answer to prayer. We may not be part of a CSA again yet, but we have organic fruit growing at our house. We've been enjoying these apples this summer especially. 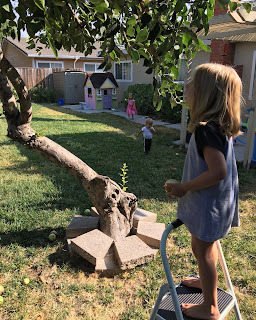 It's a little funny that the tree produces before the fall, I think; but I pray our kids remember this summer spent under its branches, picking its fruit and nibbling on them before breakfast in the early morning sunshine. As Addie was eating one just last week, she sighed and said to me, "this is the best apple I've ever tasted." So many prayers answered, right there, in that beautiful, organic moment. 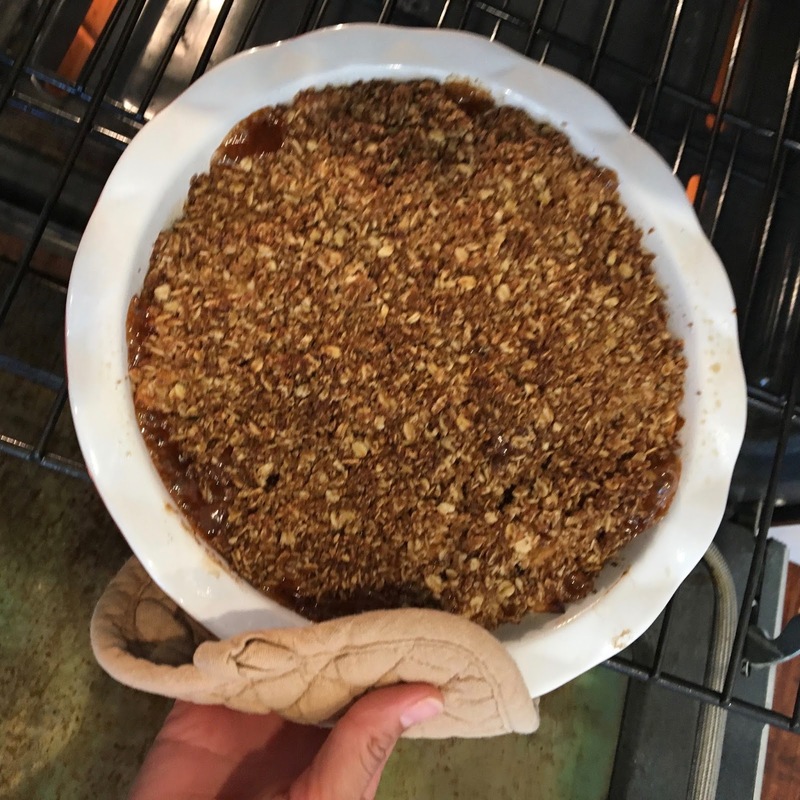 This recipe evolved from my disastrous first attempt at making a gluten free pie crust. I had never made a gluten free pie before, but with so many apples around, I couldn't very well not bake a pie, could I? But my best effort nevertheless turned into a salty, gloppy paste. 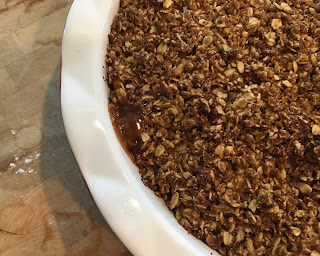 Happily, I have enough of my Grandma Teague's good sense in me to salvage the apples and make an apple crisp instead. 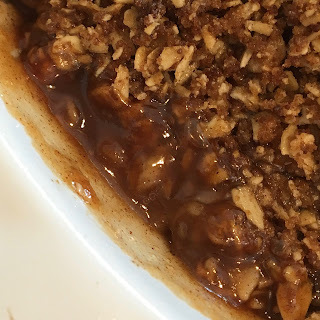 Later, as Joey spooned it into his mouth straight from the baking dish, he announced between bites, "I like this better than apple pie anyway." 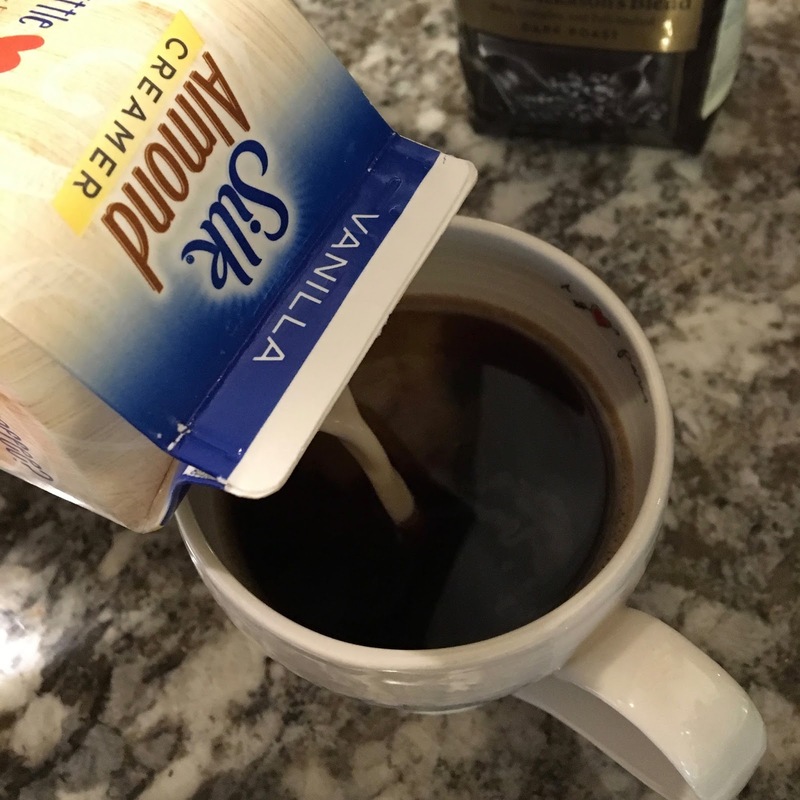 *This blend contains xanthan gum, but if yours doesn't, add 1/8 teaspoon to the filling ingredients and 1/4 teaspoon to the topping ingredients. Preheat your oven to 375 degrees and grease a 9' pie plate or glass baking dish (I take the easy way out and use coconut oil spray). 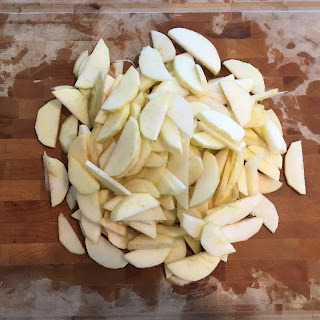 Then, the dirty work: wash, peel, and slice the apples about 1/4" thick. 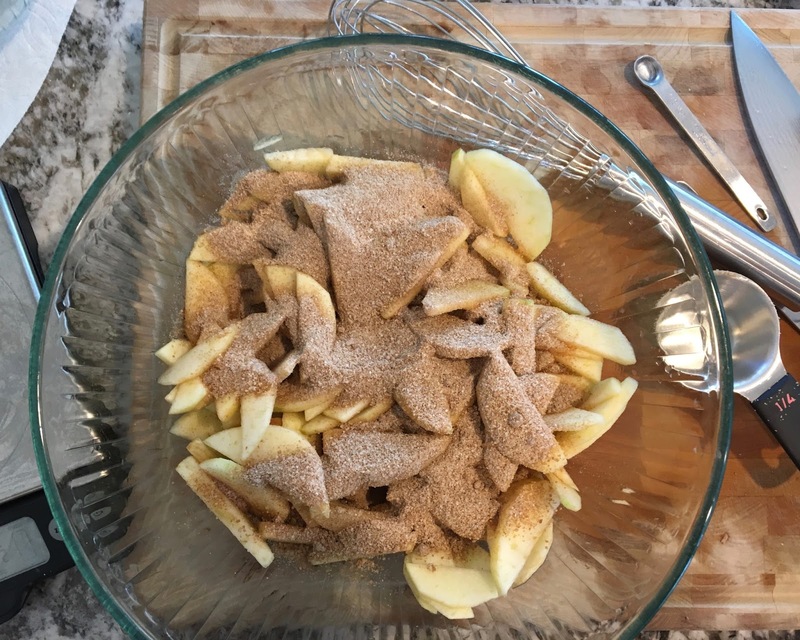 Toss them into a large bowl as you go and sprinkle the brandy on top when you're done. 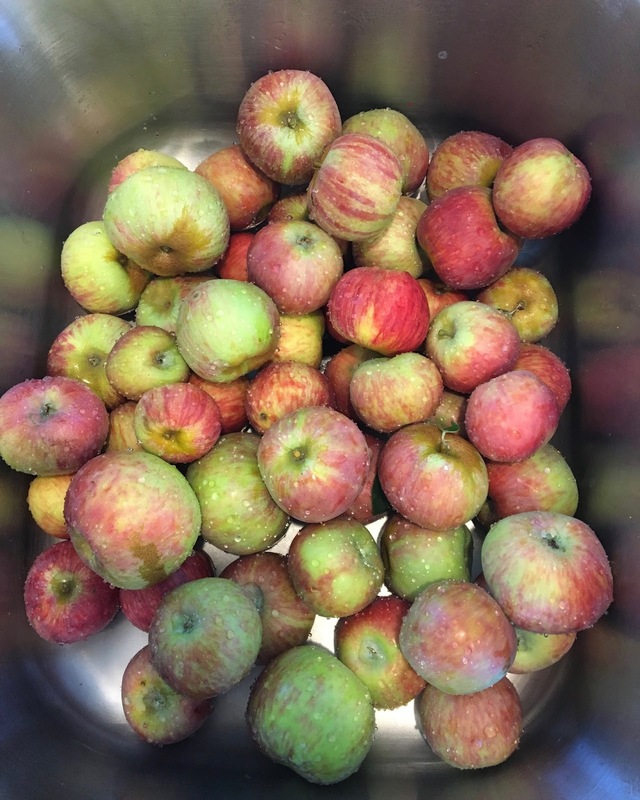 Give them a good stir, making sure the brandy is well distributed among the apples. 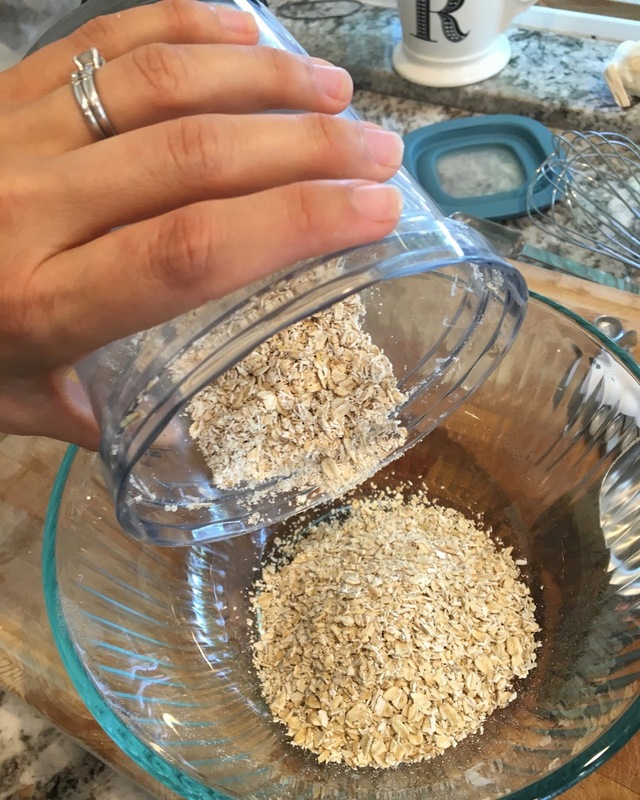 In a separate bowl, whisk together the dry ingredients for the filling. Pour the spicy goodness on top of the apples and toss it together as you would a salad so that each apple slice is coated with the sugar mixture; then pour them into the prepared baking dish. 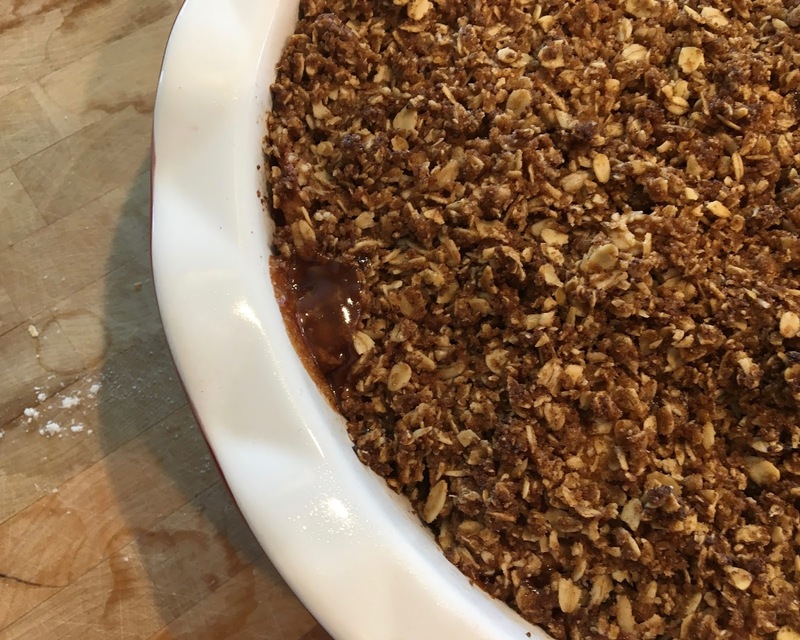 Pop it into the oven and leave it there for 40 minutes, or until the topping is golden and the brown sugar melts into spicy liquid love, bubbling up around the edges and beckoning to be married with vanilla ice cream. Last night I lost my cool and yelled at Mia. 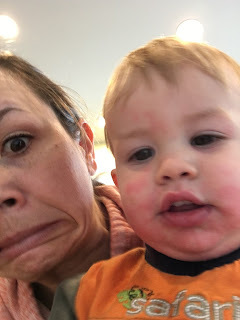 Poor thing had a fever, but I didn't know it yet: I thought she was being stubborn and unreasonable, and after a long day dealing with a whiny toddler, the last thing I needed was a preschooler crying over a potato. That should have tipped me off. On any other day, her refusal of potatoes would be a clear indication she's unwell. Our carb-loving little girl eats them with abandon, savoring them as if they were a bowl of vanilla ice cream. But last night, I misread the signs, lost control and made her cry. Later, as I finally sang her to sleep, my mind drifted to a place where guilt and thankfulness made my heart explode with love for her. I kicked myself for what I had done, and wondered at the way our little girl still wanted to snuggle close to me for comfort. I guess that's the way of it when we're facing something that makes us feel diminished. We cling to the things that anchor us and make us feel like ourselves, imperfect as they may be. Being a full time mom--fantastic and blessed as it may be--has revealed major flaws in me. A surprise, I admit. 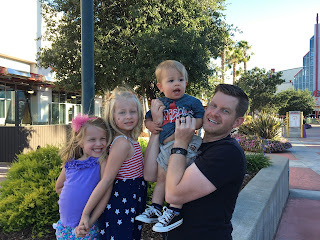 I used to think mothering would bring out the best in me, and sometimes it does, except for when it brings out the worst in me like it did yesterday. The more time I spend at home with these Goobies, the more thankful I am for the grace that covers me because goodness, I need it. From them, from you, from the Lord. Sometimes that grace takes the shape of a whispered request for "Just one more song, please Mama?" even after difficult day, and sometimes it looks like taking you up on your offer of an icy cold Moscow Mule after the kids are asleep. Lately, the bright spots look like the things on the list that follows. 1. First, I love (love!) the Keurig My-Cup 2.0 you brought home for me. My complaining finally paid off, and gone are the days when I rely on those flimsy plastic pods filled with mediocre coffee. 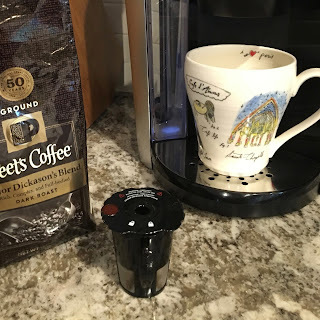 True--I agreed that getting a Keurig was a good way to make our lives a bit easier when the promise early mornings with another newborn loomed heavily before us. Now, even though our mornings are still early, my capacity for brewing a regular pot of coffee has returned, and buying dozens and dozens non-recyclable pods every month got harder and harder to do. Thanks to your thoughtfulness, I get to let go of an immense amount of guilt and enjoy my beloved Peet's without the grocery budget taking such a hit. Coffee + YouVersion Verse of the day = starting the day on the right foot. 3. Also (always), Jenny Rosenstrach. I've had a completely acceptable amount of devotion to her since I read her debut cookbook Dinner: A Love Story (DALS). You surprised me with it the same Christmas you got your appendix out. We went up North to your mom's house in Yakima that year. Finding myself surrounded by extra hands to entertain the kids, I plopped myself down on your mother's couch and did not move until I read the whole book. In the four years since that day, the recipes and anecdotes in DALS have shaped our own kitchen culture. 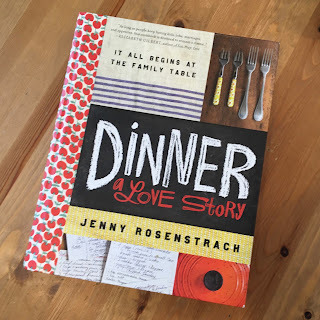 And while I hope someday we will all have dinner together every night, Jenny's advice to forego the family meal and just get the job done for awhile freed me, and I hear her voice every evening when I'm trying to finish cooking dinner in time to feed the kids who are hungry by, like, 5:00. It rarely, if ever, happens, and they tend to get bits and pieces of what's leftover in the fridge more than I like to admit. But because of her, I let go of dinnertime guilt and am thankful they get as much to eat as they do. Plus, I enjoy plopping down on the couch with you after the kids are in bed and eating spicy chicken nachos straight from a sheet pan. Her new cookbook How to Celebrate Everything is all about connecting over food and knitting together a family culture with ritual, and I need to get my hands on it soon. These and so many others are bright spots along the way, making things little bit easier just because they're there, like a mother stroking a child's feverish brow. A strange list, perhaps. But for me, these few things keep me company on a daily basis, fueling me and cheering me on to doing my day well, imperfect or flawed as it might be. Well, these things and you, of course. This is how food allergies make me feel: Trapped. Surly. 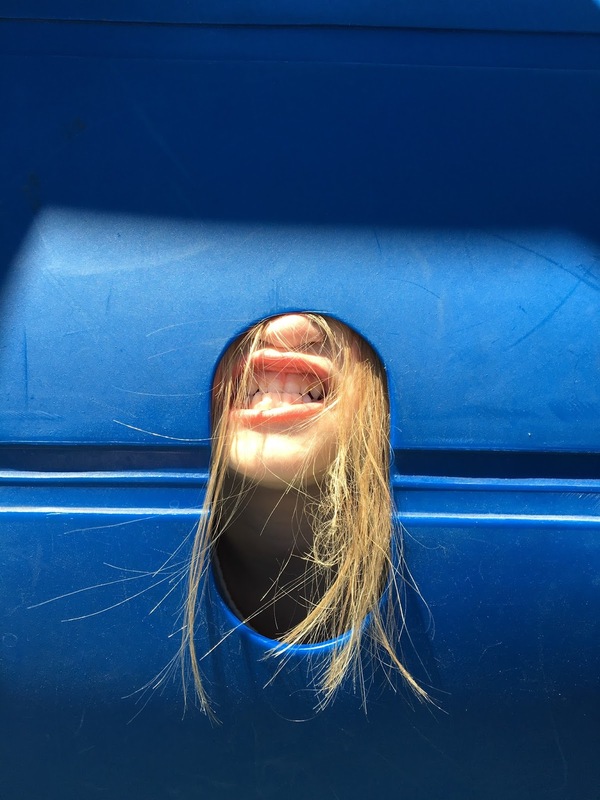 This is how food allergies make our kids feel: Separate. Left out. Much has been said -- is being said -- about food allergies, and it's no wonder: these things are getting more and more common. I read there are more of us all the time-- families dealing with food allergies who find themselves fighting a battle for which they're most likely not prepared for at all, if they're anything like us. But the frustrating thing is: I know so few of these people. In our world, it feels like it's just us. Alone. When I was growing up, I knew of two people with food allergies: Tony, a cousin; and Tina, a classmate. I don't have much memory of Tony dealing with his allergies, except for a few fragmented moments in which my Aunt mentioned how dangerous a peanut allergy can be, and how soy is in everything. I was too young to care much about what that actually meant in their day to day lives. But I do remember a bit more about what it was like for Tina. She unabashedly asked about ingredients in whatever foods were being offered to her, and everyone took it pretty seriously. And by seriously, I mean this: people believed she had an allergy, and they did their best to keep her safe and included at the same time. I remember her coming to our house once to spend the weekend with us once while her parents went out of town, which would quite an ordeal these days, I imagine, with the barrage of instructions and medications and half-crazed parents trying their best to stay sane while doling out instructions for the care takers (I know, because I am one of those parents). But 25 years ago, it was almost no big deal. Her mom dropped her off with Mocha Mix, Rice Krispies, and a big pot of chicken and rice soup to help offset any trouble feeding a dairy free child might be for my mom. Tina's mom certainly didn't insist we clear out our fridge or restrict our own consumption of milk while Tina was with us. She must have thought my mom was a reasonable person, and trusted she would take the allergy as seriously as it needed to be taken--meaning, of course, don't feed dairy products to Tina. Food allergies is a thing now, though, meaning more kids have them--like ours--and our society's infrastructure has changed a bit to address the problem. Many schools are nut free; EpiPens are normal; kids wear medical alert bracelets. Even kids without an allergy of their own are at the mercy of rules set up to keep other kids safe. 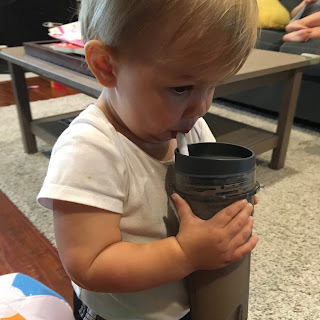 Like our own Addie: she had to give up peanut butter right along with us the day we found out about Mia's allergy, and now is learning to drink vanilla almond milk because of little brother's dairy allergy. She can't take almond butter sandwiches to school because it's a nut-free zone, and if we're at a birthday party where either of the other kids can't eat the treat provided, we make Addie skip out too. 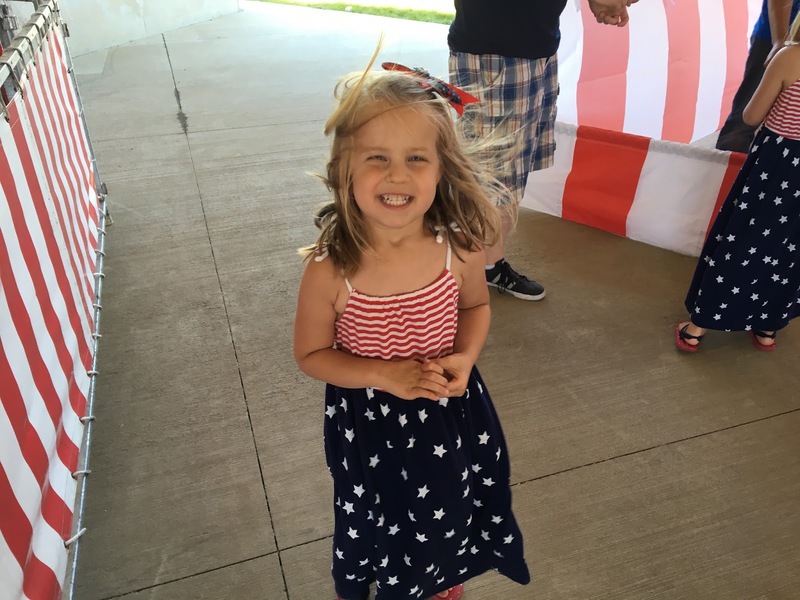 Even so, Addie takes most of it in stride because she has a pint-sized understanding of why some foods are off limits for our family. 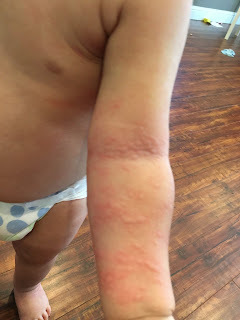 She's watched both her brother and sister break into hives, watched me cry and pray and give medicine, and even spent the afternoon in the ER after little brother suffered a particularly bad reaction. 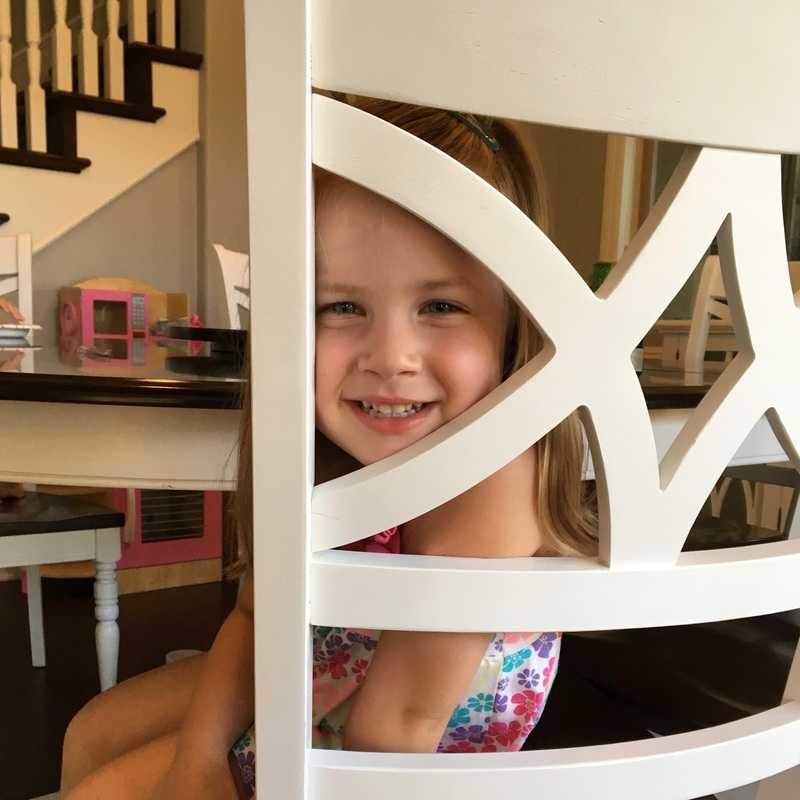 She may not have an allergy of her own, but her food life is lived within the parameters of what's safe for her sister and brother to eat, and for the most part, it doesn't bother her. But I know it must bother other kids, other families that don't have allergies. They've got to be frustrated when forced to abide by rules that are irrelevant in their own household. Like the little circle of moms at Addie's dance class who bemoaned the fact their kids had to deal with the fallout of food allergies even though they themselves don't have them. Just a few months ago, I overheard them saying how frustrated they are about not being able to send peanut butter sandwiches to school, and what an inconvenience it is to have to worry about potential allergens when packing their own kids lunches, or making birthday cupcakes, or bringing in candy for parties. They said things like: I mean really. Our kids shouldn't have to suffer because they don't have an allergy. It's not their fault nor their responsibility. 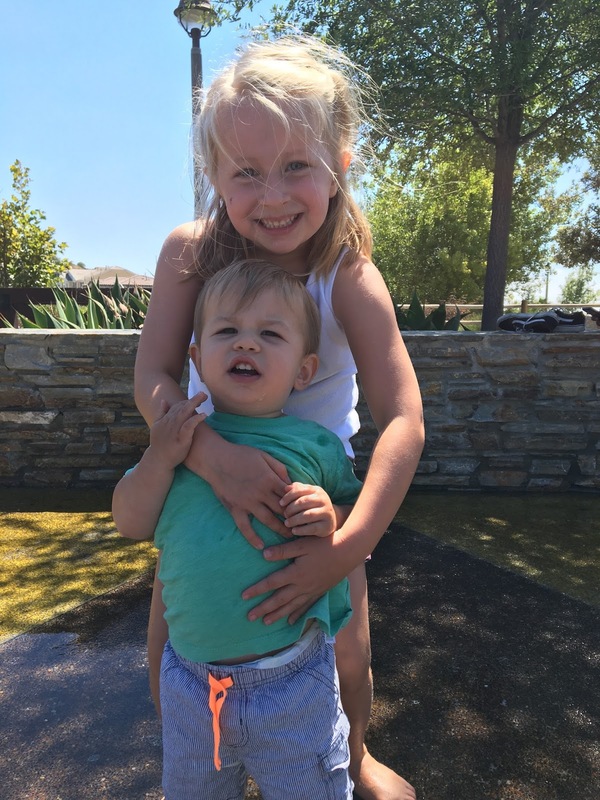 When I heard all this, I wanted so badly to walk up to them and say, "If your kids did have food allergies, wouldn't you appreciate rules put in place to help keep them safe when they are out of your immediate care?" But I didn't. I'm not brave and I feel ill-equipped for that discussion because, well, they have a point. I already feel beaten up by food allergies themselves, and I couldn't bear the thought of trying to fight another battle. I am thankful for the people around us who do the best they know how to be supportive and watch out for our kids, but even well-informed people make mistakes. 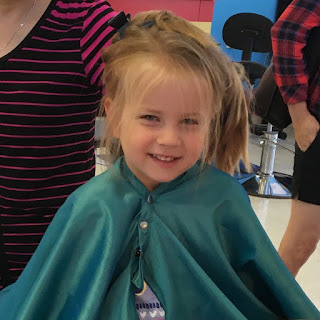 Since starting preschool a year and a half ago, nuts have snuck their way into her classroom at least three times, the most recent of which was on the last day of preschool last year when a fellow mom made cupcakes topped with a graduation cap made out of a peanut butter cup. These things happened in a nut free school that we love and trust. Not one of those people intentionally put our daughter at risk. I didn't raise a stink about it. I appreciated the gesture of making sure Mia had a cupcake too, and I was right there to explain to her what the chocolate really was and why she couldn't have one (something she used to take in stride, but is increasingly having a difficult time with). I was a little peeved, but at the whole idea that food allergies are a reality for us, and not because anyone tried to hurt Mia on purpose. Things turned out alright. Plus, I constantly beat myself up for my own lapses in judgment that have plunked our kids down in the middle of a food allergy mess. Who am I to get mad at others for genuinely trying to keep them safe and included? 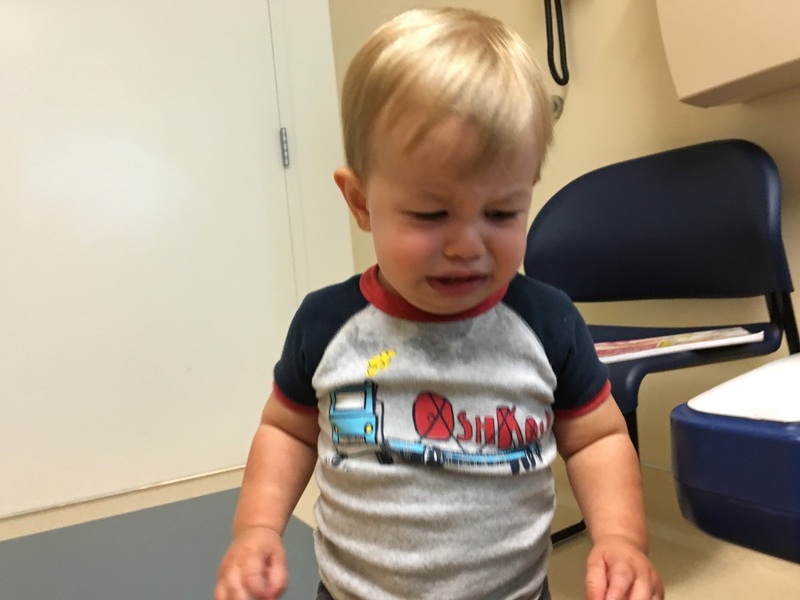 Just two weeks ago, I rushed Emery to the Emergency Department after he had mistakenly gotten a hold of Mia's empty milk cup. I should have known better than to let her drink it on the couch because Emery is getting really good at getting a hold of his sister's stuff now. I warned her not to let her brother get her cup, and to her credit, she did her best to put it out of his reach, but while I had my back turned for half a second, he stretched those little arms as far as he could, grabbed the cup, and took a sip of whatever was left. I snatched the cup away, scooped him up, and kicked myself for creating this problem in the first place while I went to find the Benedryl. He's had hives from milk before, so I wasn't panicked, exactly. 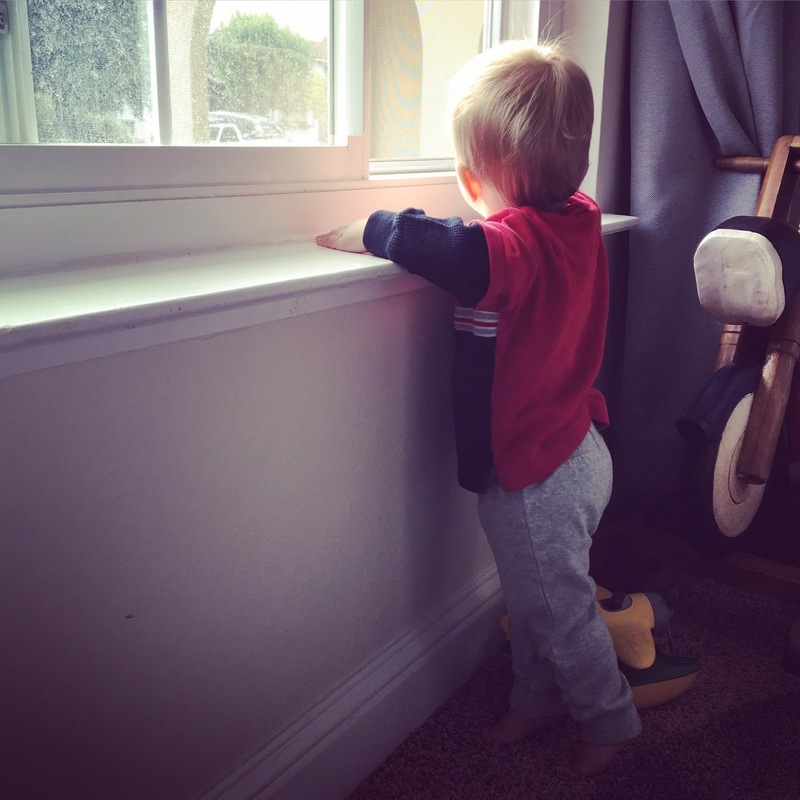 But before I knew it, his left eye started to swell, and the swelling crept down the side of his cheek, distorting his little face just enough for me to know something was different this time. I called you in a tizzy, crying and scared and very much needing you to stay on the phone with me while I used the EpiPen for the first time. You did. And after it was over, we flew to the hospital to make sure he would be alright. He was, but riddled with Benedryl, he was beside himself. 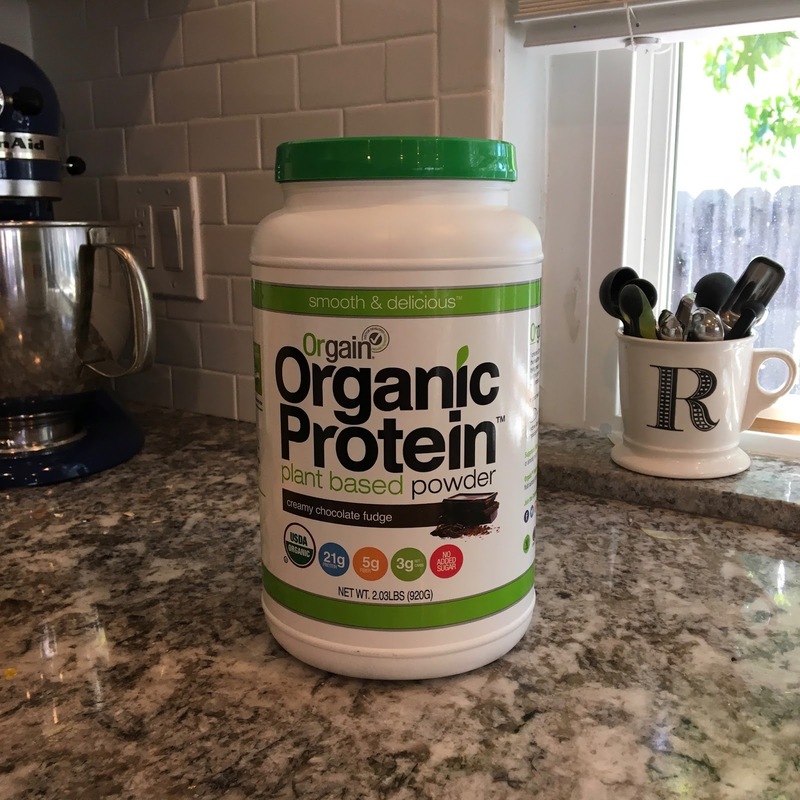 Just a week later, I gave Emery Sunflower Seed Butter, a seemingly benign food touted as a safe alternative to peanut butter. It's safe for schools. Mia eats it happily, as does Addie. Emery showed a small sensitivity to it a few months ago, but I figured that had probably passed because these things often do, and there wasn't any way Sunbutter could be a real problem for him, in my mind. 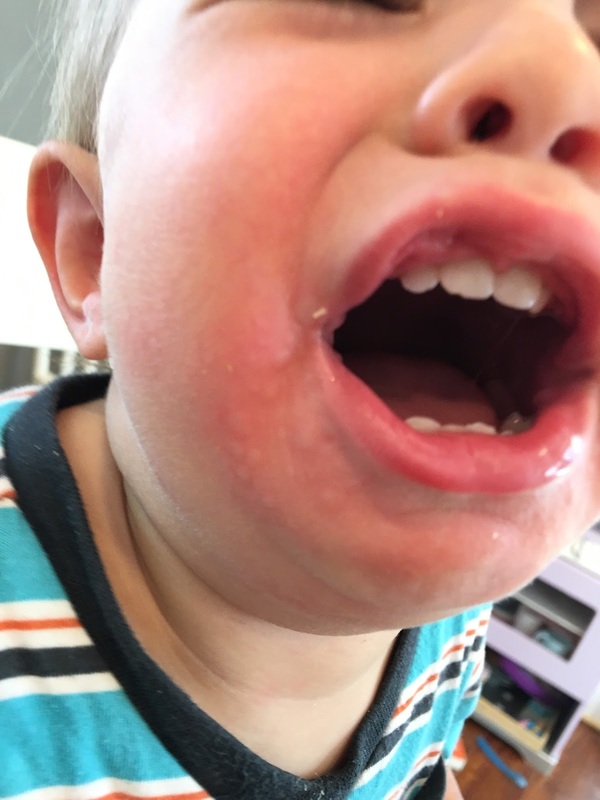 After just about a half a teaspoon of the stuff, Emery's body was riddled with hives that seemed to spread faster than any I'd seen before. They started on his chin, erupted on his left arm and quickly got thick and red and covered arms and tummy. He didn't vomit or swell or show any other sign of distress, so I gave him Benedryl and watched and waited. I admit I cried, again. Always. I can't seem to help it when this happens. This time, though, I was upset with myself, because I knew better. Hadn't he had a tiny reaction to this stuff a few months ago? Why did I think this time would be any different? And I was upset with the whole twisted food system that makes things more difficult on families like ours. And I prayed that the antihistamine would do it's work quickly as I chased our crazy boy around the house. Benedryl riles him up, causing him to rage, destructive and angry, as the medicine courses through his system. When the hives finally subsided, my parents rang the doorbell, and I let my mom hug me while I fought back tears. I was spent. I want people without food allergies to know we didn't choose this, and we aren't trying to be unreasonable. We don't want to inconvenience anyone, but we also don't know what else to do. Food allergies are inconvenient. Figuring out how to navigate this food allergy world is hard. Scouring packages, stretching dollars, trying to better understand the inexplicable. Taking risks every time we eat out. Making sure we do our best to keep our kids safe and trying not to worry when they're out of our care. It's a lot to handle. I'm thankful you're in this with me, and that we have a tribe of folks who walk beside us doing their best to look out for us, who don't regard food allergies as a nuisance, but try their best to make us feel normal. Sometimes, all I want is to feel normal again.